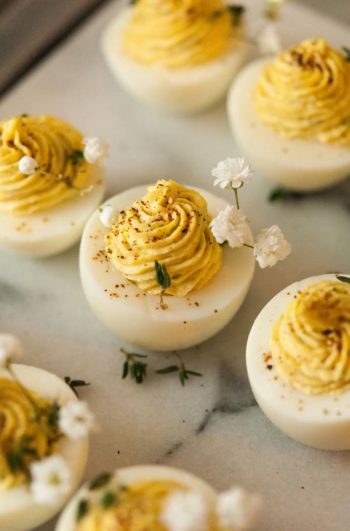 If you love egg whites and blowing your guest’s minds, these White Swan deviled eggs are for you! They’re so different, so elegant and so tasty! The white swan deviled egg is very different than your traditional deviled egg. You’ll need a full dozen eggs to make 6 eggs (12 halves) because you’ll be using egg whites for both the base and the filling. Even though this egg looks as simple as just egg white and radishes, the magic ingredient is a creamy triple cream cheese in the filling to make it extra smooth. It adds a surprise of decedent flavor. 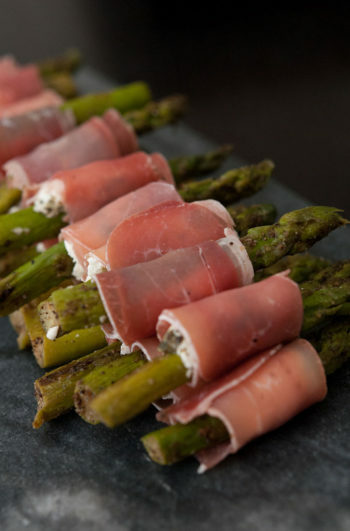 It also includes a touch of creamy horseradish to give it a little extra excitement. If you want to get EXTRA fancy, add a little caviar and a few edible flowers to these eggs to make them staggeringly elegant. 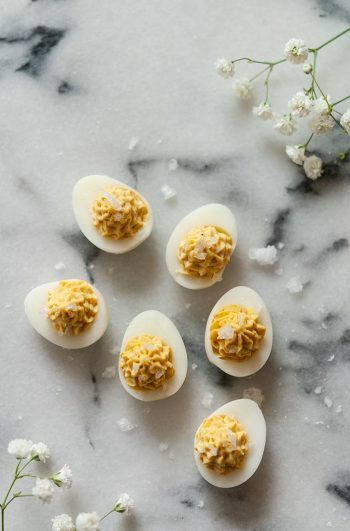 These White Swan deviled eggs are so original and surprisingly flavorful! You’ll require a pot, mesh strainer and mixing bowl for this recipe. It’s also nice to use a party piping bag and pretty tip so that your eggs are extra fancy. To get perfectly cooked eggs, put them in a pot of cool water, place them on the stove and boil them for a half hour. Once boiled, remove the eggs and refrigerate for 1-2 hours. Slice 6 of them carefully in half (the other 6, you don’t need to be so careful because you’ll be using just the whites for filling). Remove the yokes of all eggs by simply sliding them out, or using a very tiny spoon. Discard the yokes. Wash and dry you’re eggs so there is no egg yoke on any of them. You want them all pristine. Set aside your 12 prettiest cut egg halves, and put the other 6 egg whites into a food processor with your mayo, horseradish and creamy cheese. Pulse until fully mixed. If you’re filling appears a little dry, give it a taste, and see if it could use either more horseradish, mayo or triple cream. Otherwise, you’re ready to pipe your filling into your eggs! Carefully pipe your white filling into your egg halves. I highly suggest using a nice piping tip and pastry bag for this kind of egg, rather than spooning the filling in. It needs to look as elegant as possible. Place your tiny chopped radishes or caviar carefully around the side of your eggs and serve!